The Schirmer Case compels a great many images in my mind. Images of desperation and self destruction. Images of murder and deceit. Images of betrayal. The betrayal of a friend , of marriage vows, of a mother to her children, of a faith and congregation. And finally, the image of a wolf in shepherd’s clothing preying upon his own flock. 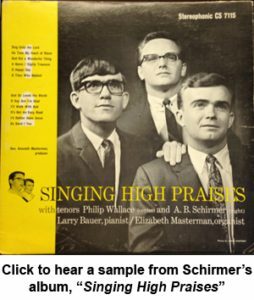 Arthur Burton Schirmer, “AB” to many who know him, was a pastor of the United Methodist Church. At the time of the death of his second wife, Betty, Reverend Schirmer was pastor of the Reeders Church located on Route 715 in Jackson Township. He and Betty lived in the residence next to the church. Schirmer by all accounts was a very good speaker. He had a magnetism that had served him well all his life. Indeed, it was his charm coupled with his religious authority that insulated him time and again from anyone who might have otherwise seen his deceptions. I became acquainted with the Schirmer Case well after Betty’s death. Unlike many of the murder cases I am assigned, no person in authority suspected foul play on the night Betty passed away. There was no call from the Control Center in the middle of the night advising me of a homicide and requesting that I contact the police. There was no visit to examine the scene. There was no conference with detectives. There was no search. There was no collection of evidence. There were no probing interviews of witnesses or suspects. There was only the image of a tragic accident. A single car crash caused by the sudden appearance of a deer on the darkened roadway. The devastating injuries to Betty’s head. The lack of injury to AB. And the blood, lots of blood, all over Betty and the passenger area of the car. Sitting here today, after AB’s trial, conviction, and sentence, the truth of what happened to Betty is as clear as the midday sun. But that is the benefit of hindsight and after years of investigation, scientific testing, forensic comparison, and crime scene reconstruction. Nothing but pity and a desire to clear the roadway was on the minds of the police the night of the “accident”. The capable EMTs were concerned were assessing Betty’s injuries and getting her to a trauma center as quickly as possible. But there were still oddities they observed. First and foremost was how calm and unconcerned AB seemed as he sat behind the wheel beside his dying wife. But he was a “man of God” used to comforting those suffering loss. Then there was the car. You see it had suffered only cosmetic damage. There was nothing the EMTs could find in the passenger compartment of the car that was responsible for Betty’s fatal injuries and excessive bleeding. They were puzzled. But beyond that they were focused on what they had to do. A very lucky thing did happen that night. Lucky for those like us who strive to seek justice. One of the patrolmen, Officer Gupko took photographs of the scene. Months later, these photographs and the evidence they depicted formed the backbone of the investigation. Indeed, without Gupko’s photographs, AB would never have been successfully prosecuted. The subsequent analysis of those photographs is what allowed the investigation to get off the ground and move from rumors and suspicion to facts and evidence. Ironically, it was another violent death that prompted a look into Betty’s death. About three months after Betty’s death and cremation, Pennsylvania State Police Troopers Phil Barletto and William Maynard were called to conduct a death investigation at the Reeders Church. The body of a man was discovered by church secretaries seated in a chair behind AB’s desk. The man had a single gunshot wound to the head. The pistol lay at his feet. The Troopers quickly determined that the man had killed himself. But why he did it and where he chose to end his life marked the beginning of the end for AB. The dead man was Joseph Musante. Joseph was married to Cindy. Cindy was AB’s personal assistant. Joseph through his daughter Samantha became aware that AB and Cindy were having an affair. Despite his best efforts to reconcile with Cindy, neither she nor AB would relent. It is possible that Joseph initially sought AB that night to cause him harm. Apparently, Cindy had tipped AB off. Telling him that both Joe and his gun were missing. AB prudently left town for the night. Not finding AB, Joe at some point, decided to end it all by shooting himself in AB’s office, behind his desk. A desk Joe built by his own hands for the pastor. To add insult to injury, Cindy continued to see AB. Eventually, AB would move into the house Joseph built. Samantha found it unbearable. Upon her eighteenth birthday she moved out. Joseph had a sister named Rose Cobb. Rose found herself at a loss to understand her sister in law. Still grieving her brother’s violent death and beset with rumors about AB’s past, Rose insisted that the proper authorities investigate AB. That’s how I came to know the Schirmer Case. A couple weeks after the suicide of Joseph Musante, Detective James Wagner and Trooper First Class Phil Barletto came to see me. They had a couple dozen photographs they wanted me to see. What occurred over the next three years was an intense no stone left unturned investigation into every aspect of AB Schirmer. During this process it seemed as if we were on a journey into the darkest recesses of the human soul. Not only were we convinced that Schirmer murdered Betty, we became convinced that he also murdered his first wife, Jewel Schirmer nine years before Betty’s death. Much of what we uncovered was through the use of a grand jury. The details are therefore not appropriate for release. However, most of that evidence made it’s way before the jury selected to decide Schirmer’s fate. The evidence was entirely circumstantial. But it was of such good quality and fit together so well that it wasn’t surprising that the jury deliberated only a short while. Do not misunderstand me. The defense called many witnesses in their case. These included a blood spatter expert and a forensic pathologist. But it was clear to me that the jury was paying careful attention to every bit of the long trial. AB took the stand in his own defense. By then the weight of the evidence was arrayed against him. I wondered if his reputation as an excellent speaker would be borne out by his testimony. You know a trial can be like a living thing. Its energy and mood change throughout. To the extent I can influence that mood and energy I will. Schirmer did nothing to alter the mood of the trial. If anything, his direct testimony hurt him. The tone and affect were not credible. The substance was even less so. My goal in cross examination was simply to take it to the next level. 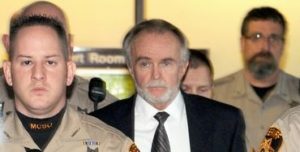 I later heard that after his testimony, as he was being escorted back to his cell AB told the deputies that he had just been convicted and sentenced to life without parole. His belief, though premature, was borne out by the Jury’s verdict. Schirmer is currently housed in the Lebanon County Jail awaiting trial for the death of his first wife. The Schirmer case took a great deal of effort and preparation. It was well worth the effort. The jury spoke the truth by their verdict. During the investigation and throughout the course of the trial, I was given valuable assistance and insight by many people. These include Detective Wendy Serfass, Trooper Bill Maynard, Detective Jim Wagner, Troopers Phil Barletto, John Corrigan, Todd Tolan, and Tom Slavin. Special mention also for Sergeants Doug Shook and Mark Holtsmaster and corporals Shawn Williams, Tom McAndrew, and Scott Sotack. Finally, I want to thank the family of “Betz” for their patience perseverance and kind spirits throughout what could only have been a painful reliving of their loss.